Cavaliers are well known for their beautiful coats. You want to keep your Cavalier looking his best, but do you wonder whether a haircut or a shave for the summer is a good idea? It’s a No-No for Show Dogs! In the United States, the Cavalier King Charles Club USA, Inc. specifies that “NO trimming of the dog is permitted. However, it is permissible, and often desirable, to remove the hair growing between the pads on the underside of the foot.” Trimming hair between your pet’s pads is allowed to prevent slipping or problems walking. If your Cavalier King Charles has no championship aspirations, however, you are free to ignore Kennel Club rules and regulations. But consider the following before deciding to trim, clip or shave your Cavalier Spaniel. Dog breeds can be described as single-coated or double-coated. Double-coated Cavalier Spaniels have both a topcoat of longer hair as well as a soft, thicker undercoat. Brushing your Cavalier regularly helps maintain their smooth, silky coat. As the weather turns warmer, use a deshedding tool to clear out the thickness of your dog’s undercoat. Without shedding, your dog’s undercoat can become so matted that it prevents air from reaching your dog’s skin. When the undercoat is thinned out, air circulates more freely between the hairs of the top coat, and keeps your Cavalier cooler. So why not shave your Cavalier for the summer? The longer topcoat hairs actually protect your dog’s skin from the heat and sun. Your pet’s topcoat provides a water shield, keeping the skin and undercoat dry. The topcoat also provides protection against mosquitoes and other insects. Your Cavalier’s coat may grow back thicker and curlier, rather than returning to the long silky coat most admired in this breed. In short, clipping your Cavalier’s coat short may actually increase the risk of sunburn and overheating – the opposite of what you intend! What if your Cavalier’s coat must be shaved for a medical procedure? Or your frisky friend got into something too sticky to be cleaned by any other means? Just remember, shaving removes your Cavalier’s natural safeguards against heat and sun. Keep your shaved pet’s exposure to direct sunlight and high temperatures to a minimum and stay alert to signs that your dog has become overheated. As your Cavalier King Charles’ coat grows back, regular brushing will be your best chance of returning his coat to its original texture. 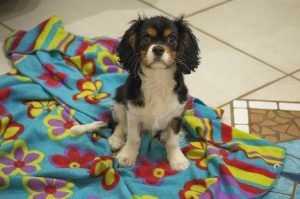 ← Cavalier King Charles Spaniels – Do They Shed?